I know I've commented several times on the amazing guide book that is eat.shop. 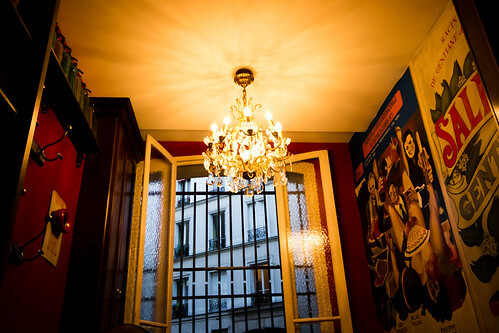 Seriously, if I were ever fortunate enough to live in Paris for a month, I would hit every recommendation in that book. 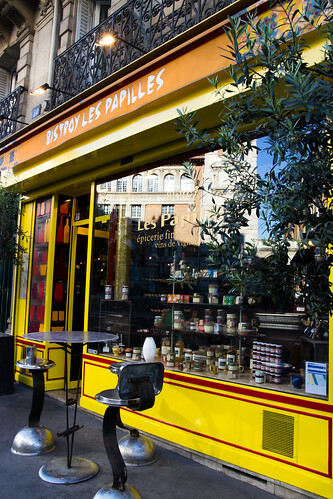 Bistroy Les Papilles was a restaurant we visited for dinner on an eat.shop recommendation, so needless to say, we absolutely LOVED it. It was right up there with Le Chateaubriand as one of our very best meals on this trip. Maybe ever. Les Papilles has a lot of character. 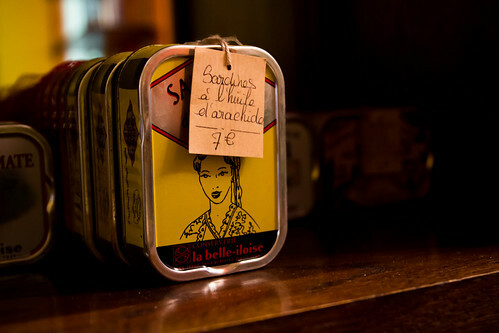 The space is narrow; one wall is lined with a large selection of wine and goodies like canned sardine and jarred pate. Cured meats can be seen hanging by the bar. The decor is warm, inviting, and colorful. There is also a private table downstairs in the cellar. The kitchen is one of the tiniest I have ever seen - smaller than the one I had in my old one-bedroom condo - and this fact is made even more impressive when you consider the caliber of the food that's being prepared in that crammed space. 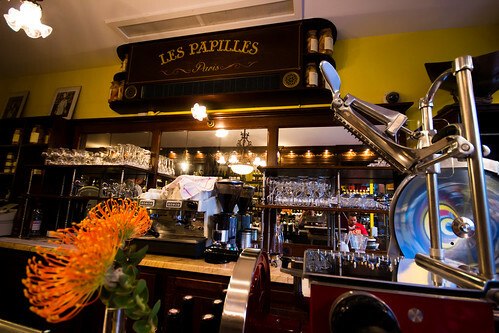 Les Papilles offers a four-course prix-fixe menu for 33 euros. There is only one menu, which varies daily. We started with a bottle of wine recommended by the owner - a hearty French bourgueil to match what was to come in our meal. All wine consumed with dinner is priced at 7 euros above retail price. The first two courses were served family style. 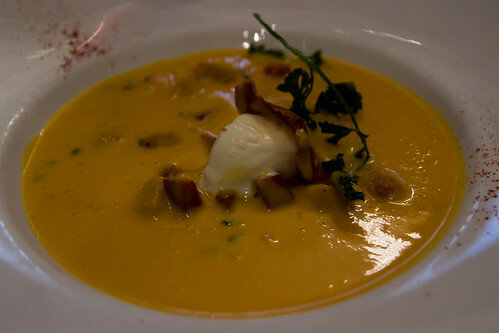 First came the Sweet Potato Soup that was large enough for two bowls per person. 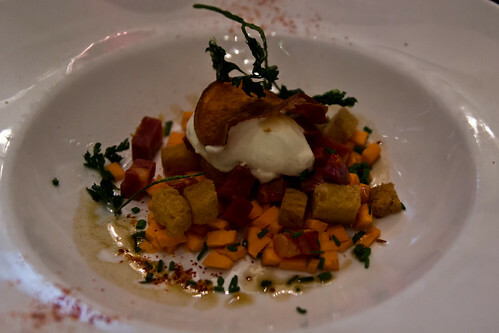 The fillings consisted of croutons, chorizo, sweet potatoes, cream, and a potato crisp. It was divine. Next came beef cooked in wine overnight, served with potatoes, sundried tomatoes, carrots, snow peas, and onion. The meat was super tender in texture and savory in flavor. Again the serving was huge, but we ate every last bite as though we'll never get to have food this good again! Then came the cheese course, a Blue Cheese and Prune Cookie soaked in red wine. Believe it or not, the prune and the blue cheese went quite well together. 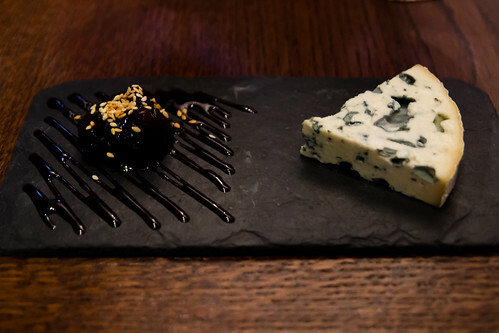 Neither R. nor I is a huge fan of blue cheese, but the prune took the edge off the cheese and made it quite palatable. What a smart combination! 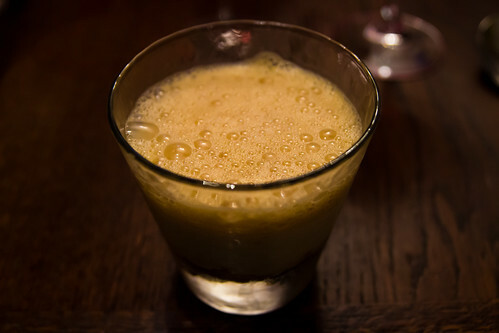 Finally, we had a Banana Panna Cotta with caramel on top as our dessert. R. called it a "cornacopia of senses in the mouth - so many flavors!" It was truly delicious. 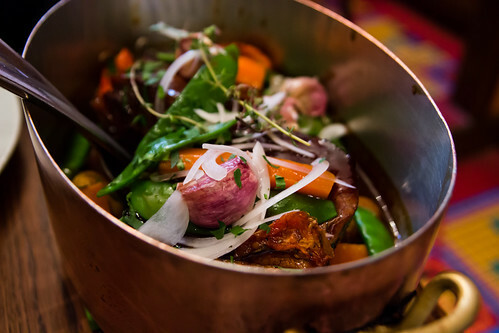 Les Papilles has a Michelin Bib Gourmand designation, which recognizes restaurants offering high-quality, good-value meals. 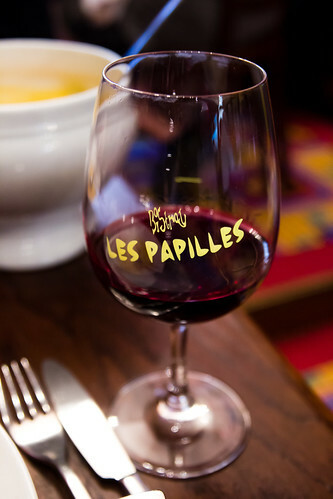 Les Papilles certainly deserves the honor. 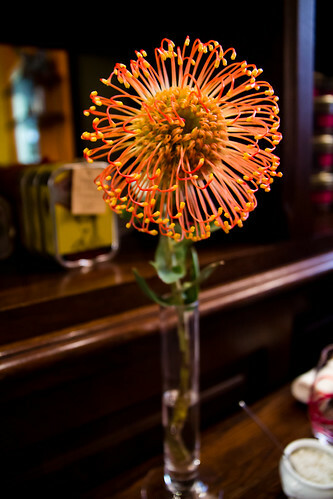 Having a good reputation also means the bistro gets quite busy, so reservations are highly recommended. Either call a few days ahead, or do as I did and make a reservation by email; the owner himself will respond.